As you walk through the door at 400 Vine Street you instantly have the feeling you’ve been there before. 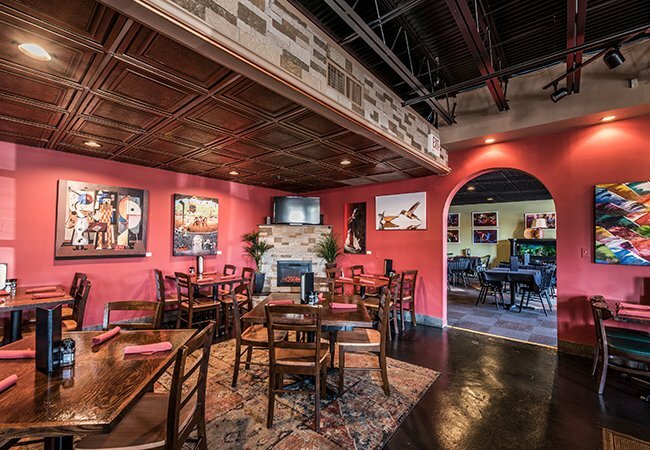 The space is cozy and welcoming with colorful walls and a variety of local artwork decorating the restaurant. Offering a diverse menu combining Southern with influences of Thai, Indian and Latin with an “everybody knows your name” ambiance there’s something for everyone at Ranada’s and that’s exactly how she planned it. An eclectic new neighborhood restaurant opens in the former Wines on Vine location. Several dishes on the menu pay homage to chefs Riley has worked with before. Former Natasha’s owner Gene Williams shared his recipe for hoppin’ John with Riley. She also created a lentil loaf inspired by Ouita Michel’s nationally recognized beet loaf. 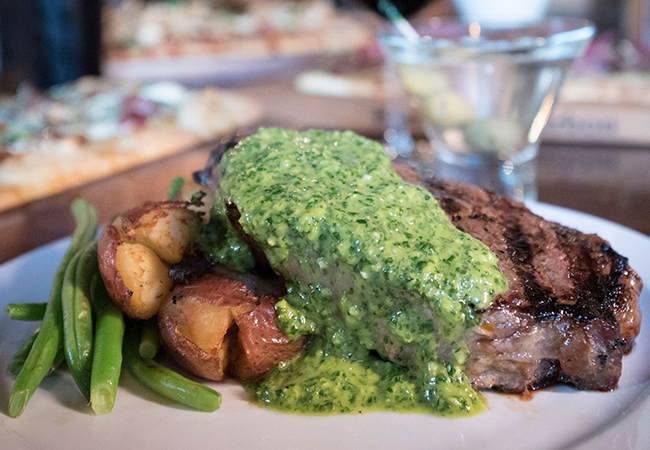 Churrasco steak, a dish she cooked with well-known Louisville chef Anthony Lamas is Riley’s favorite dish on the menu. 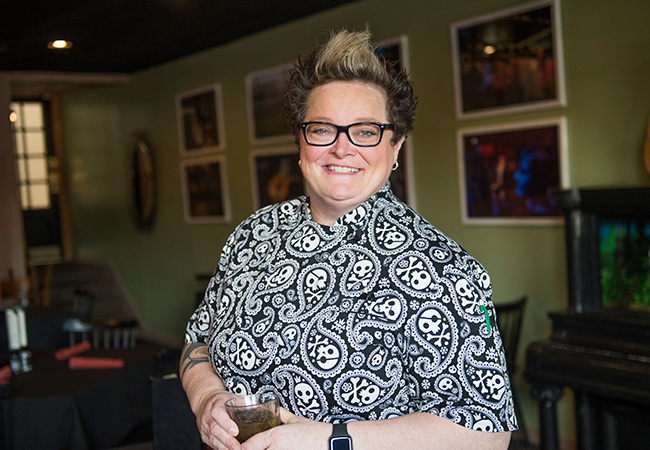 After leaving the Lexington Diner, Ranada worked as executive chef in several of kitchens from Louie’s Wine Dive to Chenault Vineyards and feels like opening Ranada’s has been her rebirth. “I’m finally in a great place, this is the style of food I have always wanted to do,” says Riley. Riley doesn’t stop at lunch and dinner. She offers a killer brunch menu served Saturday and Sunday from 10-3 which she describes as “going all out”. The brunch menu offers dishes like Salted Caramel Apple Waffles, the classic Hot Brown turned into a 3 egg omelet stuffed with ham, turkey, bacon and tomato drizzled with mornay and spring onion. Then there’s the Beef Tenderloin Benedict, a combination of toasted English muffin, filet medallions, sauteed spinach, poached eggs, lump crab meat and hollandaise. 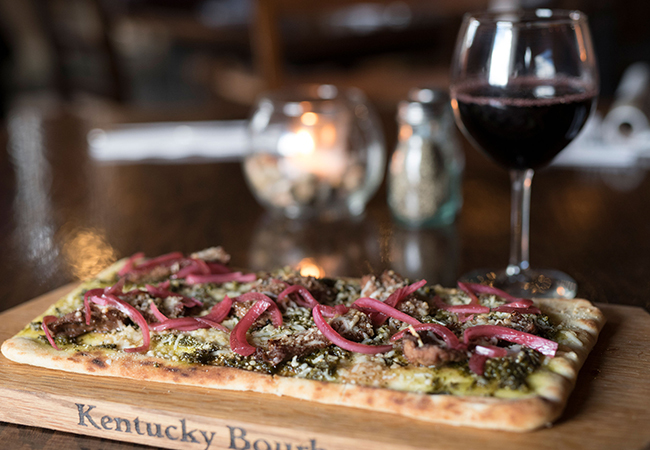 If you’re a fan of live music you can find local artists playing on Friday and Saturday and then there’s the not-to-be-missed happy hour, Monday-Friday 2-6 pm where you can find $1 off all draft beers, $2 domestic bottles, $5 select wines by the glass, $3 well drinks and $8 flatbread pizzas. “Starting in the spring, we will have happy hour all day on Monday,” mentions Riley, “which I am pretty excited about”. Asparagus sautéed with a little salt and pepper. Simple is best! Watching my mom and grandmother cook. Some of their go-to’s were shake and bake pork chops and hamburger helper. My mom made eggrolls and it fascinated me. By teaching. I love to watch it click and they take it and run with it. Do you have a morning ritual if so, what does it look like? When I get to the restaurant, I turn on lights, make a cup of coffee and turn on the music - I am in a big blues and jazz kick right now I love the 70s+80s. Favorite dish from your childhood? Jack Nicholson. As a kid, I had a big crush on him, and I’ve always wanted to meet him. He has such a big personality, so I’d make a big dish. What do you love most about Lexington? I have been here so long it’s a small town feel in a city. I feel like I know so many people here. The support of the community I’m in right now, Chevy Chase is different - these folks are loyal. Ladies from the woodlands pile in and want to introduce me to their friends. It’s amazing. When you’re not working are you cooking or grabbing carryout? Carryout - I like to hit the restaurants downtown. Work in a year before you go to school. If you love it, then go! Bake off the bacon and then chop into small pieces. Combine bacon and all ingredients in a pot and cook for about 20 minutes on medium heat until “jam like”. Cool and put into clear quart containers with label and date (shelf life is about 7 days).